Active Directory administrators often find themselves provisioning the same type of user accounts. 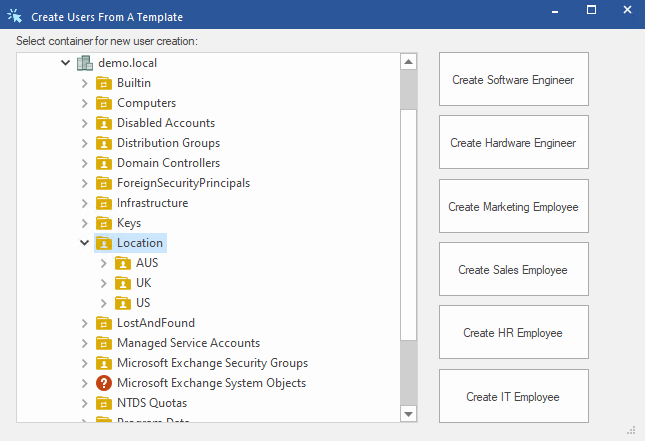 In addition to being able to import users from a CSV, DSRAZOR for Windows gives you the ability to create standard templates for these user account types and delegate their use to your helpdesk staff. Account creation can be forced to conform to your corporate standard with a number of options. See how DSRAZOR can increase your IT staff's productivity today. Quickly create frequently provisioned account types from fully customizable templates.